This card was a big hit at my January camps...then sadly, I discovered that the set is no longer available. I'll tell you about it before I share the tutorial - hopefully some of you were able to snag it before the supply ran out or, you can BEG Stampin' Up! to bring it back! During the second half of last year SU! had a contest for stamp set designs. They first had an in-house competition and the winning set was Spread the Joy. I loved the samples I saw at Convention and I'm so happy I got it. I'll be using it often, I know. I'll be asking SU! to give us a digital version too! NEW BANNER PUNCH - this will be offered FOR FREE when Sale-A-Bration starts on January 28! Stamp the image from "Spread the Joy" set with Whisper White ink on Basic Black cardstock; emboss with White Stampin' Emboss Powder (set with the Heat Tool). Cut out & set aside. Texturize both 1" wide Basic Black strips one at a time by placing them diagonally in the Fancy Fan folder (position so you have at least two full fan-shape rows). Place each in opposite diagonal directions from each other so the textured strips have a fan pattern that face up and toward outer edges of the card on both sides. 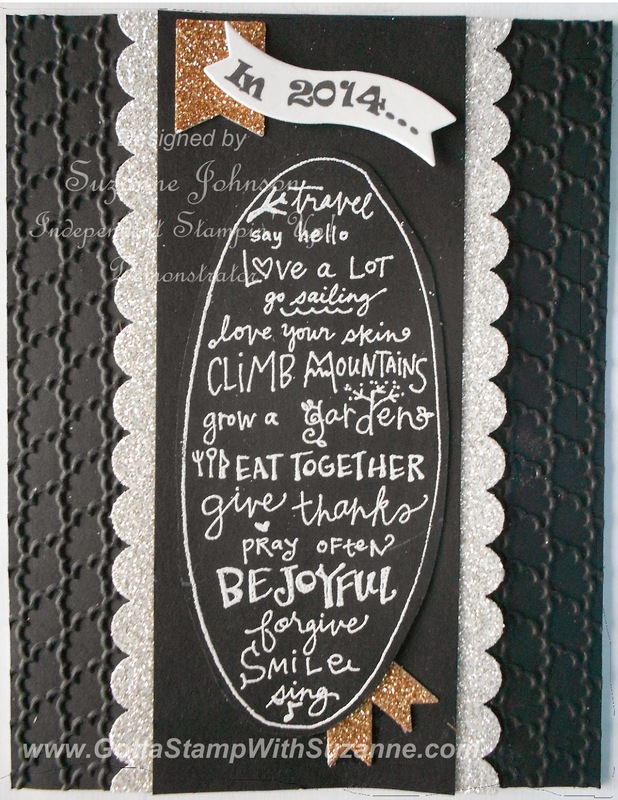 Use My Digital Studio to create the wavy text "In 2014 . . ." in a font of your choice. You'll need to print some trial versions and tweak it until it fits well inside the wavy Bitty Banner Framelit. Print on Shimmery White Cardstock. Use the wavy Bitty Banner Framelit to cut out the printed text with the Big Shot. Use the smallest Bitty Banner Framelit to cut Champagne Glimmer Paper with the Big Shot. Punch a Champagne Glimmer Paper banner with the Banner Punch. Punch one edge of each Silver Glimmer Paper Strip with the Scallop Border Punch. Now you are ready to assemble all your pieces! First, adhere the Basic Black texturized strips to the right and left sides of a vertical card - align the corners and outer edges and make sure the pattern is symmetrical. Adhere the Silver Glimmer Paper punched borders to the edges of the Basic Black panel and be sure they are evenly matched on both sides. Snail adhesive is a great choice for this because you may need to reposition the borders a bit and the snail will hold it but not be messy. Adhere the center panel with the borders attached to the center of the card: I put a little liquid Multipurpose Glue on the back of the borders and snail or Anywhere Glue on the Basic Black. You want to be sure the borders stick to the textured side panels. Cut the little Champagne Glimmer Paper banner in half and position the halves under the stamped cut-out image on the center panel, then adhere with adhesives of your choice. Adhere the punched Champange Glimmer Paper banner to the top left corner of the center panel (leave a bit of a border). Put pieces of Stampin' Dimensionals on the wavy text banner and adhere above the stamped image. Stamp "Happy New Year" inside your card!